Brunnhoelzl has provided the ultimate aluminum racing jacks and pit stop equipment for over 20 years. Pit Stop USA is The Online Motorsports Superstore! Brunnhoelzl Racing has been in business for over twenty years, constantly developing and redeveloping new products to meet the growing demands for faster and better pit stops. 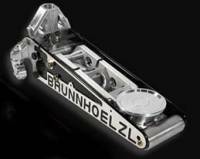 George Brunnhoelzl, is the inventor of the lightweight aluminum racing jack. His innovation many years ago has brought pit stops to where they are today. Brunnhoelzl Aluminum Pit Jacks and Brunnhoelzl impact guns are specially designed and widely used in the NASCAR Nextel Cup, NASCAR Busch Grand National and NASCAR Craftsman Truck Series. Brunnhoelzl Racing is all about providing you with the best possible computer-designed, CNC manufactured pit stop equipment. Brunnhoelzl takes great pride in their workmanship. Brunnhoelzl has in-house CNC computer-controlled machining and a state-of-the-art quality control service. Brunnhoelzl is a company that listens to their customers, whether and responds by developing needed innovations to help you to the winner's circle. We proudly feature the full line of Brunnhoelzl racing products including Brunnhoelzl Bump Steer Gauge, Brunnhoelzl Caliper Centering Tool, Brunnhoelzl Fueling Accessories, Brunnhoelzl Catch Can, Brunnhoelzl Dump Can, Brunnhoelzl Male Probe, Brunnhoelzl Female Dry Break, Brunnhoelzl Hinges, Brunnhoelzl Jack Accessories, Brunnhoelzl Dirt Skirt, Brunnhoelzl Dirt Wings, Brunnhoelzl Jack Handles, Brunnhoelzl Jack Tray, Brunnhoelzl Jacks, Brunnhoelzl Garage Jack, Brunnhoelzl Pro Flat Jack, Brunnhoelzl Pro Series Jacks, Brunnhoelzl Warrior Series Jacks, Brunnhoelzl Pit Gun Accessories, Brunnhoelzl Pit Gun Carrying Case, Brunnhoelzl Air Hoses, Brunnhoelzl Pit Sockets, Brunnhoelzl Pit Guns, Brunnhoelzl Rear End Tube Tool, Brunnhoelzl Air Regulators, Brunnhoelzl Aluminum Shifters, Brunnhoelzl Shock Adjustment Tools, Brunnhoelzl Throttle Ignition Override Switch, Brunnhoelzltiming Boards and Brunnhoelzl Toe Plates.